There is every reason to believe that van Gogh suffered from a focal epilepsy accompanied by simple focal and complex focal seizures. Even if all van Gogh's unexplainable and 'strange' behaviour cannot be interpreted as symptoms of epilepsy (as has often been rashly attempted in many works about the painter's illness and in descriptions of his short, and apparently hectic life), there can be no doubt that van Gogh suffered epileptic seizures at irregular intervals in the last two years of his life. Of course, the etiology of his epilepsy can no longer be definitively ascertained. It was probably a symptomatic type of epilepsy. A difficult, protracted birth, pronouncedly abnormal behaviour in childhood but normal intelligence, and focal and possibly also secondary generalized epileptic seizures pointing to the temporal region as the focus of the epileptic activity: these mosaic stones fit together to make a picture of a residual epilepsy after cerebral damage caused in early infancy. 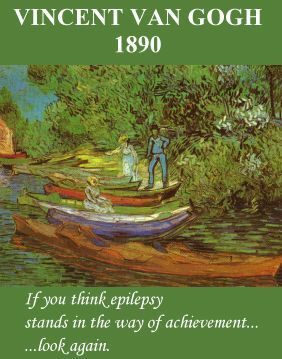 Perhaps there was also a genetic tendency to epilepsy in the family: there are indications that van Gogh's mother's sister, his brother Theo, and his nine years younger sister Wilhelmine also suffered from epileptic seizures for a time. 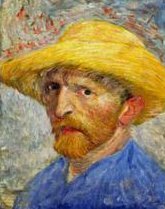 As already stated, van Gogh did not suffer from epileptic seizures until the last two years of his life, in what was remarkably his most artistically creative phase. It will never be known in how far the therapy-resistant seizures played a role in van Gogh's decision to commit suicide. However, the painter's letters reveal that his seizures were a source of great suffering for him. His last words, spoken to his brother on his deathbed, enable us to guess some of the tragedy he himself felt about his life which had been so full of misfortune and disappointment: 'Sorrow is eternal'. Poster by the Epilepsy Foundation of America. The poster shows the picture 'Bank of the Oise at Auvers', which Vincent van Gogh painted in July 1890, shortly before his death. In the last two years of his life, van Gogh suffered repeated epileptic seizures.